Question of the Day: Is Protective Styling a Must for Growth? As a new natural (1 month; transitioned for 11 months), people have been on me about protective styling for hair growth. But, as I perused your blog, I noticed that you did not do much protective styling and have managed consistent growth. Your hair looks healthy and beautiful. My question to you is do you subscribe to the notion that protective styling is a must for growth (I may have missed something on your blog about this)? I’m pretty much a wash and go girl and I am not a big fan of weaves or braids. I would love your opinion on the matter. Regarding protective styling – I am one of those rebellious naturals that doesn’t believe in it for the most part. For one, your hair is always growing, it’s retention that is the issue. A lot of people look at their hair length and say that their hair is not growing, but technically, it’s incorrect. It’s just that their hair is breaking off just as fast as it grows, so the length remains the same. Unless you have a medical condition or nutrition deficiency, your hair IS growing. 1. 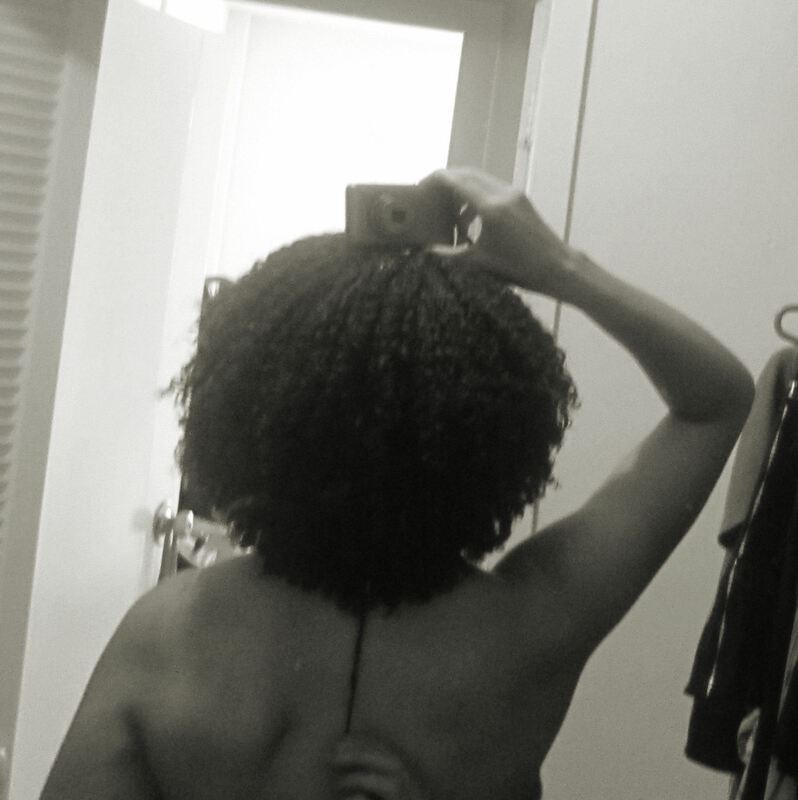 Some women experience extreme tangling when they do wash and gos due to shrinkage. Extreme tangles = difficult detangling = breakage. I love my wash and gos, so I did a video that gave tips on how to minimize tangles – http://www.youtube.com/watch?v=aS60nLRa6-A. Washing my hair in sections has almost eliminated my tangles. I can detangle quickly in the shower now. Also, applying product thoroughly ensures that your hair is properly moisturized, encourages clumping (less tangles when your curls are in sync), and lessens shrinkage, especially with a gel. 2. Once your hair reaches a certain length, it will rub on your clothes. This can cause breakage, especially if you are wearing “harsher” fabrics, like cotton and wool. When my hair reaches this length, I plan to mitigate this issue by wearing my hair off my shoulders more (buns, loose ponytails), and wearing clothes that my hair won’t rub on much – think tank tops, strapless tops, etc. Luckily, thanks to shrinkage, my hair only reaches my chin when I wash and go, so it’s not rubbing on anything once it’s dry. I like shrinkage for this reason. When I’m wearing my hair straight, I usually keep it in a bun. The main thing you need to do is monitor your hair – if you are seeing excess shed hairs (handfuls of hair) or lots of little broken hairs when you touch your hair, around your house, in the shower/sink, and when you detangle, you should re-assess your regimen. Do I think that it’s possible to eliminate breakage? No. The ends of your hair are old, and they are going to break a little. Almost everything “weathers” our hair – touching, the sun, wind, hot temperatures, cold temperatures, combing, brushing, pulling, rewetting, etc. I don’t fret if I get 3 broken hairs when I do my weekly detangling. Three pieces of hair is nothing compared to the amount of hair we have on our heads. But if I constantly saw little hairs on my clothes (like I did when I had a relaxer), I would worry. The only thing weaves/braids do is tuck away your ends so they can’t break off, which yes, will help with retention, but if they are done incorrectly, they can also cause damage to your hairline. Furthermore, if you do not care for your hair properly while it’s in braids or weaves, you may end up with very dry hair, which causes breakage. I’ve never gotten a weave/braids because I don’t have a stylist that I trust, and I’m scared I wouldn’t know how to take good care of my hair. Anyway, I hope my very long answer was helpful, lol. Happy hair growing! I’m Lazy, You Pick It. I so agree with you. I am one of those low maintenance naturals. I cannot twist, I cannot braid. This is why I love wash n gos. Another youtuber anaturalbeauty3, has great information about protective styling not being necessary to get your hair to grow. It is my belief that constant hydration, moisturizing and sealing is the key. So far so good, it has been working for me. Also when I watched your video on keeping the tangles to a miniumum, and how to apply product; it changed my life. I did it yesterday, and I was able to do a wash n go in less than 20 minutes. It used to take me 45 minutes alone to wash my hair, plus adding in product. I figured out too, I was using way to much product. Keep it going. I agree. Protective styling isnt essential, however preserving your end is. Ive seen alot of people say they attribute their massive hairgrowth to never wearing it out… However there are others with the same lengths that do. Whats the point of having beautiful hair if you are always going to keep it cooped up and hidden? Not fun at all ! Ive come a long way growth wise from 1 inch in 2009 to apl now 2 years later. I style my hair in many ways. All in fun though, not in desperation for length. It comes no matter what. I stopped PSing for a year and still reached apl. I threfore stopped believing in that along with deep conditioning. One thing that is haird though…. Because my hair all around is tightly spiraled cork screws, mu wash n go is a no no. it results in extreme tangling and matting in high density hair… Not to mention the tightness of my curls makes my apl hair shrink to a twa… Which is so not my look! This summer I am looking for low manipulation styles fit for this wild hair of mine. Im co.sidering bunning but im unsure if I can keep my hair stretchrd. Its just so much of it! Oh yeah, I didn’t do any protective styles, and my hair thrived and was healthy and thick! When my hair was much longer years ago, that’s all I did was wng, but I did get tangles as my hair got longer. To fix that I would get a trim which was maybe twice a year. But, I want to know does it make a difference to slightly dry your hair BEFORE applying all your products because the water drips from the ends, which I thought would cause your ends to get dry. So, is it necessary to dry your hair a little before applying your products then shake the excess water out? I can’t comment on that, I’ve never dried my hair a little before applying products. Once I let it almost fully dry, and that was a disaster with the shrinkage and tangles. I started getting more tangles as my hair got longer (it’s APL now stretched) but washing in sections has alleviated that issue. Protective styling isn’t a must for me, but I do it sometimes when I am tired of doing my hair and want a break (I admit it!!) Usually my haircare routine is simple. Wash 2 to 3 times a week, and on the days I’m not washing, I co-wash or just run warm water through my hair, and immediately use some leave in conditioner and oil. I also DC once a week, although I would like to up that to twice a week. But when I have braids I generally wash once or twice a week, make sure I keep it conditioned and oiled and keep a spray bottle of water/conditioner to keep my hair moisturized. I do notice growth when I take out my braids, but I don’t really wear them for that reason. You gave her excellent advice. I believe the logic behind protective stying, is leaving our hair alone, it does not ‘make your hair grow’ but helps with keeping the already grown ones. I will wear a hairstyle if i want to not because my hair needs to be ‘protected’. I recently noticed i was retaining more length doing wash n gos, or just 2 huge cornrows than when i styled with stretched hair only because,it involves less manipulation. When I moved from the US, I started checking natural sites to see how I could maintain while in Ireland. I would say that since I’ve been here my hair growth seems the growth has stalled–though I can’t seem to break the habit of getting hair cuts (last cut December ~ 2″)! I don’t do wash and go’s anymore but I don’t actually protective styles either. Life would actually be easier if I could wash and go but even when I was living in Georgia (with the heat) it took almost a full day for my hair to dry. It takes forever for it to dry here. I have to say, without really trying it seemed the hair grew faster during those days. I think because it was uber moisturized which helps keep potential breakage at a minimum. Excellent explanation on caring for the hair and helping to retain length! I found this very helpful to me because I am always monitoring any SSKs, or breakage when I am doing a WNG because I want to be able to retain length. I was watching a YT video of Anthony Dickey, the founder and owner of Hair Rules & Hair Rules Salon. He said that we should keep our hair very moist and conditioned. He said to trim hair every 3 months otherwise the hair at the ends snap and result to breakage. He says for looser curls to only trim every 2- 2 1/2 months. To cut only 1/4 of the hair not an inch because to cut within 6-8 weeks when the hair may not have even grown within this time frame. I debating about trimming. I have been going every 3 months for a trim, but I get afraid. I don’t want my stylist to get scissors happy!! 😦 I told her I am trying to grow my hair long. I can tell she likes to keep my hair in a bob. Cause she was pulling on the front like she wanted to maintain the cut. Izzy has been taken off on her journey! 😉 You must be so proud of her and yourself for taking good care of her. I am a YT junkie with always looking for the right regimen of care. LOL, I’m sitting here on napturality looking up the same info. I don’t really like bunning but I think I’m going to challenge myself to do it for a month. Oh and only wash once a week, and not two times a week. I was able to finally get one whole freaking inch of growth last month, I want to see how much I can get with a new routine. I was doing the baggy method, wash n goes, and wearing a cap (with a satin bonnet under it) almost everyday, washed 3 times a week. Next stop bunning, wash once a week, product staples and testing the same routine. I can’t wait until my hair is long enough to bun! I love messy buns. When my hair was long I wore them like everyday and really only wore my hair down when my friends and I were going out. I agree. I never do protective styles & I’ve been able to retain length just fine. From 1.5in in January 2010 to shoulder length now. I also agree that low manipulation helps. I just leave my hair alone! When I’m home lounging, I always wear a satin bonnet. Always. I don’t sleep w/o tying my hair up & I don’t sleep with elastics in my hair. I cleanse & DC once a week. Refresh w/moisturizer as needed & co-wash as needed. Henna once a month. Listen to your hair, not other people so much.